Toothaches, gum bleeding or chipped teeth come without warning; even a moment of carelessness can cause serious health problems if neglected. The children and elderly of the household are vulnerable to dental emergencies. Being patient till next morning can be too heavy a price to pay. So it is best to note down the telephone numbers of some emergency dental clinics. Be it at midnight or first few hours of sunrise; in case of dental injuries one must consult their nearest emergency dentists. Even when other dental clinics remain closed; an emergency dentistry will remain open 24/7. Hence, you can rely on an emergency dental clinic near you when such a situation arises. Keeping a few contact numbers of them proves to be an adequate precautionary measure. A suburb of San Francisco and Oakland, the City of Antioch is a part of the Contra Costa County in California. The population of the city being about 102,372, Antioch is a fast growing city suburb as it is close to the infamous San Francisco Bay Area. 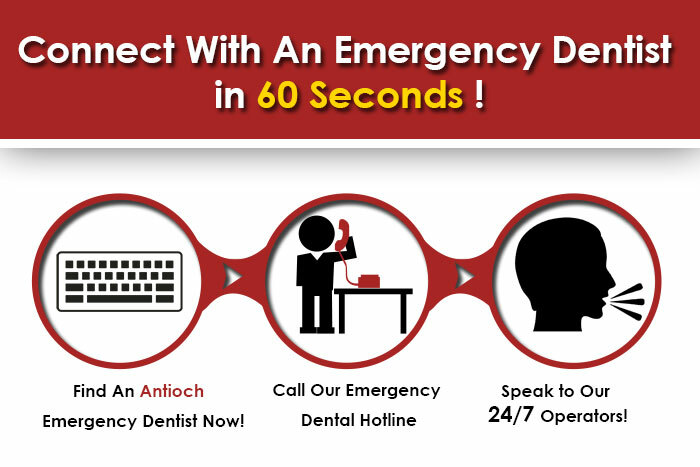 Keeping some telephone numbers of emergency dentists hence can prove useful to residents of Antioch, California. The following is a list of emergency dentists and dental clinics that cater to your dental emergency needs. Their addresses and telephone numbers are provided for your convenience. Keep these numbers handy as you never know when a problem might arise. Located at 5201 Deer Valley Rd #3b, this clinic is the office of Dr. Mark W. Miller DDS and Dr. Ryan Simarro DMD. Their office is equipped with state of the art technology, such as digital X-ray and intraoral photography. Their telephone number is 925-754-6020. Dr. Kannan Komandur, Dr. Archanaa Naidu, and the staff believe that patients should be given the necessary information about their dental health. Invisible braces, implants, root canals, and crowns, Invisalign, bridges, etc., are some of the services they provide. They accept PPO insurances, such as MetLife, Cigna, Humana, Delta Dental, and many more. For appointments, billing information and queries, call their number 925-778-2400. The location of Lone Tree Dental is 3700 Sunset Lane Suite #5. This pediatric dentistry is the office of Dr. Amit Goyal DMD, who is dedicated in making each visit to the dentist fun, safe and comfortable. A visit to the clinic’s website will bring a smile to your face. Dentures, Whitening, Dental Extractions and Dental Implants etc. are treated with utmost care. Located at 5125 Lone Tree Way, they can be contacted at 925-775-4586. Antioch Dental Care provides general, specialty, and cosmetic dental care to its patients along with free consultation. They are renowned for their superior quality dental care and flexible financing options. It is located at 3200 Lone Tree Way #100. Call them today for more information or to book an appointment at 925-754-2122.